Hive World sells this cute novelty Smoker Keyring with a tiny battery operated light to help you find the keyhole on a dark night! Great beekeeper’s gift idea. includes a battery operated tiny light beam to help you find the keyhole on a dark night. definitely will have appeal to the beekeeper in your life! 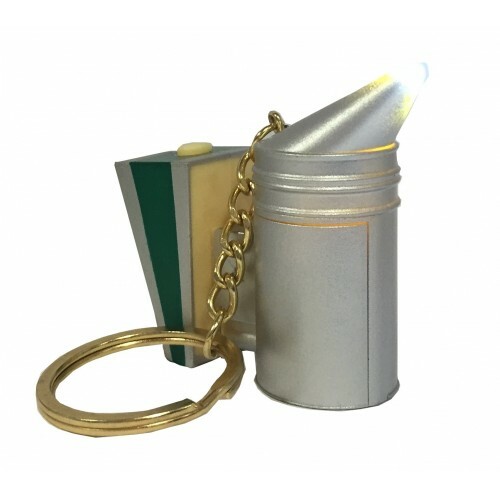 The Smoker Keyring and Torch is an ideal stocking filler for the junior wannabee! dimensions measure 40mm x 20mm x 48mm (L x W x H). activate the light by pressing the button on top of the smoker bellows. uses 3 x AG13 Button Cell batteries (included). These are inside the side slot on the smoker. Apply pressure to slide the slot down to reveal batteries then simply remove the paper battery saver tag to operate.